In the latest edition of our Meet the Designer series, we introduce Kelly Chin, a designer from San Francisco, California. 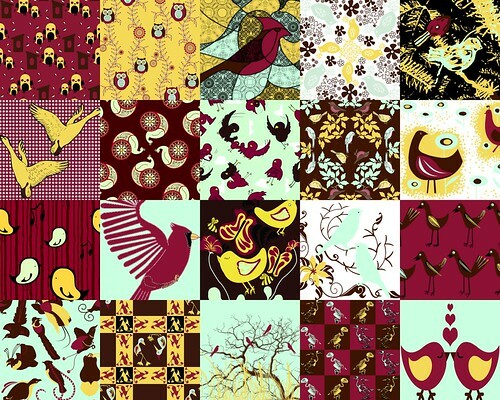 Visit her Spoonflower shop, and keep reading to find out her influences and aspirations. 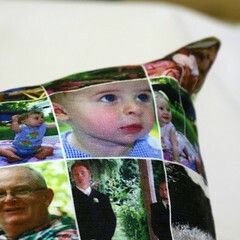 Question: Can I use Spoonflower to print my photos on fabric? 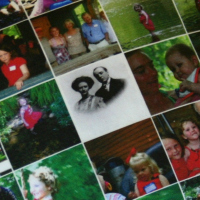 Yes, digital textile printing is terrific for photos. Pictured here is a pillow — a gift for a family member this Christmas — that I put together with the help of photos from my Flickr photostream, Picnik's collage feature, and Kim's sewing talents. This pillow is made from Spoonflower's linen-cotton canvas, which makes for a nice sturdy pillow fabric, and a 16" pillow form (from Amazon). First I set up a front panel on Picnik with 8 rows and 8 columns of photos, which at "high" quality produces a collage image exactly 2400 pixels x 2400 pixels in size. 2400 pixels conveniently prints at 16 inches using 150 dpi. [Note that the 8×8 layout is available only to Picnik premium members, but you can do the same thing in almost any image-editing program, including the basic program that probably shipped with your digital cameras.] After setting up a back panel the same way I saved both files to my hard drive. To save a bit of time, I used Photoshop Elements to arrange the front and back panels into a single file, leaving room for a quarter-inch seam allowance on all sides (on Kim's advice). I uploaded that file to Spoonflower and ordered it on linen-cotton. Two 16" panels are slightly too large to fit onto a fat-quarter of linen cotton (27"x18"), but you can still economize by arranging several sets of pillow panels onto a single yard ($24.30). One of the advantages of using the linen-cotton canvas is that the fabric is preshrunk, so if you set up a 16" panel and wash it before sewing you'll get very little, if any, shrinkage. 1) Start with a clear, high-resolution photo. A typical digital camera these days produces images that are 4000 x 3000 pixels or larger. You could print a 4000 pixel wide photo on Spoonflower at up to 26 inches across. Keep in mind that you can always reduce the size of an image that's too big (you'll see a size editor on the lower right of the Spoonflower fabric preview page ), but you can't make a small photo larger. Blowing up small images creates pixelation. 2) Find images with good contrast. Fabric can't hold the same level of detail that photographic paper can hold (which is why 150 dpi is our default resolution rather than 300, the resolution used by printers working with paper). Good contrast between the foreground and background is essential to make the subject of your photo clear when it is printed on the fabric. I've seen people do some lovely work with old black and white photos and postcards, for example. But if you have a lot detail that is lit the same way — in mixed light and shadow, it probably won't print very well. In the detail photo on the left, the photo just to the right of the black & white portrait printed badly because the faces weren't well-lit and there wasn't enough contrast in the features to make them distinct. 3) Look for evenly-lit subjects. Especially if you're printing photos of people, look for subjects with good, even lighting, like the baby in the photo on the right. Textile printing systems are designed to handle one-to-one color matching very well, but don't do as well reproducing subtle gradients, which is the forte of photo printers. You can get around this issue by choosing photos that don't rely so much on gentle transitions between light and dark shades of color to reproduce well. Lots of people write us to ask how they can learn to design their own fabric, which is sometimes a challenging question to answer. Textile design is, of course, something many people spend years studying. But if you make the question a bit simpler, there are lots of ways to create lovely designs on textiles. Many, many people have access to digital photos these days and some familiarity with doing simple edits and uploading them to web sites. 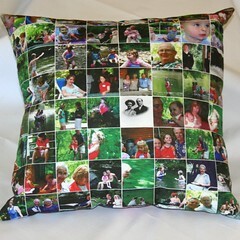 Creating a photo pillow — per the simple instructions above — is one way. Creating fabric using a scanner and some simple objects — leaves, for example — is another. The best way to learn is to experiment. 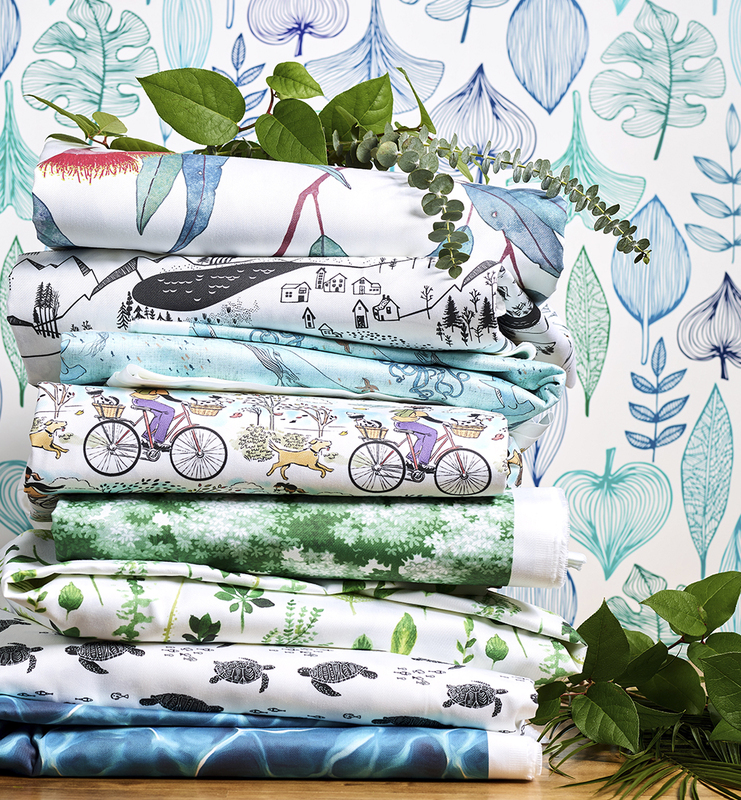 One of our goals at Spoonflower is to make digital textile printing easy enough, fast enough and affordable enough to make that sort of experimentation possible.